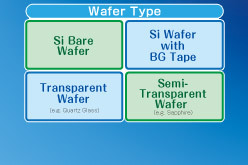 JEL developed new aligner "SAL3000HV Series" (Full auto-adjustment version) that allows alignment for various kinds of wafers. Self-adjustment aligner will save the labor and time of making inquiries or sending the actual aligner to the manufacturer. JEL ALIGN TOOL comes with Aligner SAL3000HV series that have been released on December 14, 2016. Modification of the shipped product will be available on request. Please contact our sales representatives for the product details. Three features of "JEL ALIGN TOOL"
No adjustment of threshold or LED illumination is required. Full auto software does all the adjustment and setting. Just click Adjust Start button! ALIGN TOOL speeds up alignment on site. 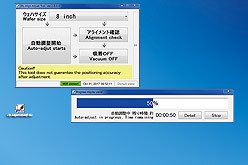 *Please note that this tool (software) is not for guaranteeing the positioning accuracy after adjustment. Make sure to check the positioning accuracy by using the customer’s inspection device at customer’s side.